Uefa president Michel Platini says the best way to tackle racism in football is for referees to stop a match whenever there is abuse. "Referees can finish the game. 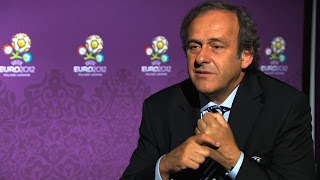 They have this power in case of racism," Platini told the BBC's David Bond. A BBC Panorama programme highlighted incidents of racism at stadiums in Poland and Ukraine, who will co-host Euro 2012. Asked about the footage shown in Panorama's documentary, he said: "We are shocked about racists but we are trying to do something; we have to fight against that. "I feel bad. Of course I feel bad because I am not a racist." Platini insists officials will book any player who walks off the pitch without permission - even if they are a victim of racial abuse. The clarification comes after Manchester City and Italy striker, Mario Balotelli threatened to walk off the pitch if he believed he was a victim. The Ukrainian president, Viktor Yanukovych,has downplayed fears over racist attacks in Ukraine saying hooligans were known to the authorities and security services "will be watching all the matches closely"